There are few things that get a young puppy as excited as meal time. Its the second activity they learn to get pleasure from and when they are with their litter mates, meals are the highlight of their day. When people transition a puppy into their homes, most guardians simply put food in a dog bowl. While this is certainly an option, there is a better, more beneficial way to feed your dog that actually increases a puppies IQ. By giving your puppy a way to “earn its food” you can help boost its confidence, slow down how fast they eat and provide a time consuming activity that more closely resembles how they get food in the wild. There are a ton of food dispensing toys available. If you want to feed your dog out of one of them, make sure the hole the food comes out of isn’t too big. In the above video I mentioned it being a problem if the hole is too small, but too big is also an issue. Recently I was helping a client in Denver and wanted to get his dog eating from toys this way so we headed to Petco. But the only treat / food dispensing toys they had featured giant holes where all the kibble spilled out at once. The goal is for a little bit of food to come out at a time. As I mentioned in the above video, sometimes you have to remove a tab to make sure the food comes out easy enough to keep your pup’s attention. Another treat / food dispensing toy I have is the Ethical Pet Seek-A-Treat Shuffle Bone Dog Puzzle. Id recommend you get 4-8 of these toys; choose various shapes and configurations to maximize your puppy’s problem solving skills. Most of them come in different sizes so be sure to select a size that is right for your pup. I include a link to the toys displayed in the videos at the bottom of this post. 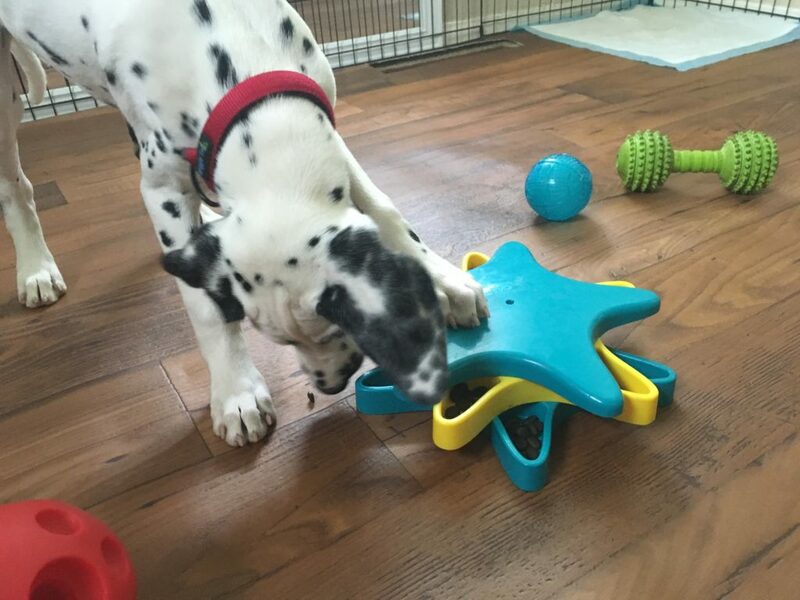 While making your puppy work for his or her food is beneficial during the first few months of their life, letting it continue to do so after about 4-5 months of age can condition your pup to eating off the floor. In some pups, this may lead to them being a scavenger and attempting to gobble up anything they see not he ground when out on walks. Not every dog develops that issue, but its a possibility. So after your puppy turns 4 or 5 months of age, transition into a traditional feeding bowl. If your puppy does start to think anything they see not he ground on walks is to be eaten, we will go over a Leave It exercise in a later post that will show you how to stop your dog from that behavior. Kong (the original treat dispensing toy aka Kong. Keep in mind Kongs come in different strengths or durability. Red is standard, black is for more advanced / aggressive chewers.